n 1663 King Shō Shitsu dispatched the Sanshikan Chatan Uēkata Chōchō as a gratitude envoy for his investiture to Qing China. Chatan, who was the uncle of famous Ryūkyūan statesman Haneji Chōshū, arrived in Fuzhou in 1664. At the same time Eso Uēkata Jūkō was dispatched as a congratulatory envoy for the enthronement of the Kangxi emperor. But his ship was attacked by pirates and shipwrecked near the mouth of the Min river near Fuzhou. Eso and others escaped to Fuzhou, whereby golden pots meant as articles for presentation to the Emperor were stolen, and a murder case among the members of the entourage occurred. In 1665 both Chatan and Eso returned home to Ryūkyū. The pirates were actually Ryūkyūans disguised as Chinese. Accused of abetting the theft of tribute articles, the sailor Uema killed Kyan Chikudun Genji and his attendants, which where all members of the entourage. Chatan Uēkata took advantage of being a congratulatory envoy and instigated retainers of his. The golden pots were stolen by Chatan’s retainer, Yonagusuku Niya, but were further stolen by Nakandakari Niya. Then, Chatan’s retainer Miyazato Shī joined hands with Nakandakari, and they also brought in the physician Kyusai, and together they killed Yonagusuku by poisoning. The golden pots then were sold locally. Another sailor knew this, so Miyazato threatened him and gave him hush money. Chatan, knowing of the involvement of his retainers, tried to hush up the incident and allowed the participants to disembark on Iheya Island during the return voyage. In the 3rd month 1667, Chatan and Eso as directors of the missions were held responsible. Chatan for having demonstrated selfish behavior towards his retainers on board, and Eso for his unlimited cowardice in fleeing from the (false) pirates. Accordingly they were condemned to decapitation. Furthermore, both their children, altogether eight kids, were exiled. The twelve persons charged with theft and murder had to pay charges. On 1667/08/21, Chatan and Eso were executed. This became known as the Chatan Eso Incident. 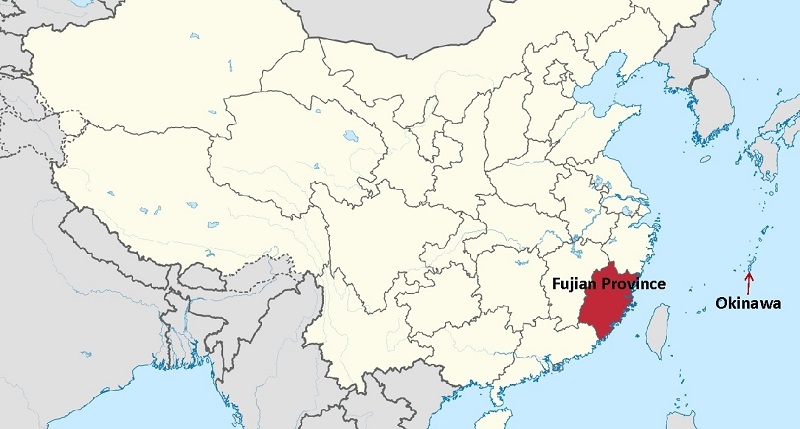 Map showing Fujian province and Okinawa. Matsuda Mitsugu (松田貢): The Government of the Kingdom of Ryūkyū, 1609-1872『琉球王統史 1609-1872年』. A dissertation submitted to the Graduate School of the University of Hawaii in partial fulfillment of the requirements for the degree of Doctor of Philosophy, January 1967. Smits, Gregory: Visions of Ryukyu: Identity and Ideology in Early-Modern Thought and Politics. University of Hawai’i Press, Honolulu 1999, pp. 24-25.